Save on clearance Hidey Huts (REGULAR size), with removable, potty pad. Great for one piggy! We're clearing out our inventory. Act fast and save! 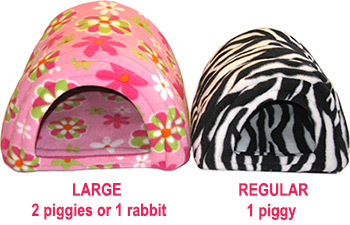 This listing is for our clearanced REGULAR SIZE Hidey Huts! These are a cavy favorite for snoozy piggies. Our removable Potty Pad makes spot cleaning a breeze! Just wash with your other piggy laundry as needed. This design is piggy tested and proven to last. REGULAR: 10" x 10" x 8"